A subpoena is a court-ordered demand that a person appear in court or other legal proceeding, or that specific documents be produced and presented at a specified date, time, and location. The Latin word subpoena means “under penalty,” and if a person refuses, or fails to comply with a subpoena, he is subject to civil or criminal penalties. To explore this concept, consider the following subpeona definition. 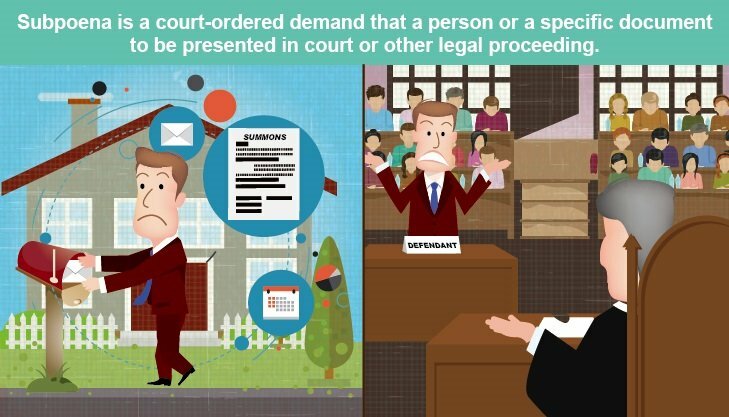 A legal document ordering a person to appear in court, or to provide the court with specific documents. A legal document summoning a witness, or ordering the submission of evidence, before a court or other investigative body. A subpoena is a legal notice that requires a person to appear in court as a witness, or requests that person to present documents related to a court case. There are two types of subpoenas: (1) subpoena ad testificandum, and (2) subpoena duces tecum. While both of these require a person to take specific action, the requests differ. Subpoenas can be requested in all types of matters, including civil and criminal court proceedings. They are commonly used in custody, property, and divorce cases. When a person is served with a subpoena duces tecum, they are commonly required to deliver the specified documents or items to the attorney that requested them. The subpoena duces tecum specifies where, and by what date and time, the documents or evidence should be delivered. Alternatively, the subpoena may demand that the recipient make the items available for inspection and copying on a specific date. Mary files a civil lawsuit claiming that her supervisor at Happy Enterprises sexually harassed her, and that, when she reported the harassment, she was fired. Mary’s attorney issues a subpoena duces tecum demanding that Happy Enterprises turn over company emails between Mary and her supervisor, as well as any emails, letters, or other documents in which Mary reported the harassment to her employer. The subpoena also demands the company provide copies of all correspondence related to Mary’s termination, including letters, inter-office memorandums, and emails. The subpoena requires that the documents be delivered to her attorney’s office by May 12th, at 5:00 p.m. The Latin term subpoena ad testificandum translates as “to testify under penalty.” This type of subpoena, sometimes referred to as a “court subpoena,” requires the recipient to attend a trial, hearing, or deposition, and testify under oath. The subpoena ad testificandum will specifically state the date, time, and location the person should appear to give testimony. Mary’s attorney issues a subpoena ad testificandum to one of Mary’s co-workers, who she says witnessed her supervisor’s sexual advances on more than one occasion. The co-worker is required to attend a deposition on May 25th, at 9:00 a.m., at the office of her attorney to give testimony. A deposition subpoena varies slightly from other types of subpoena, as it requires an individual who is not a party to the legal action to testify or produce documents at a deposition. Depositions often take place somewhere other than the courtroom, such as an attorney’s office, during the pre-trial or “discovery” phase of a lawsuit. A Notice of Deposition, which states the date, time, and location of the deposition, must be included with a deposition subpoena in order for it to be valid. The individual being served a deposition subpoena must be given advanced notice, the amount of time provide in each jurisdiction’s code of civil procedure. If the person subpoenaed does not comply with a deposition subpoena, he may be subpoenaed to testify in court once the actual trial portion begins. Subpoenas are used in all types of state and federal, criminal and civil, court proceedings. Subpoenas give attorneys, plaintiffs, or defendants an opportunity to obtain information related to the court case. The information gathered is then used to help the attorney or party prove or disprove the case. The type of information obtained comes in the form of witnesses to be used during trial, or through various documents and tangible evidence to be presented to the court. In most cases, subpoenas are issued by an attorney involved in the case, as attorneys are considered officers of the court. Parties to a legal action may obtain a subpoena from the clerk of the court by filling out a subpoena form. Such a subpoena is reviewed, then signed by a judge or other court officer before being returned to the party requesting it. The subpoena must then be serves on the recipient according to the rules of the court. In the event a high-level government official needs to issue a subpoena, it must be signed by an administrative law judge. While obtaining and filling out a subpoena can be done by lay individuals, it can be a complicated process that must be done correctly in order for the subpoena to be considered valid. Many people choose to seek the advice or services of an attorney to ensure the subpoena process is accomplished within the bounds of the law. Once a subpoena has been issued, the original form must be served on the recipient in a manner specified by law, to ensure he has received the official notice. A subpoena may be served by any competent individual over the age of 18, not related to the case in any way. The manner of service, whether personal, mail, or notice and acknowledgement of receipt, is specified in each jurisdiction’s rules of civil procedure. Because the original subpoena form is served on the recipient, the party serving the subpoena should keep a copy in his files. It is very important that an individual served with a subpoena not ignore it. Because the subpoena is a tool used in the court’s legal process, failure to respond or comply with a subpoena may result in contempt of court charges. The individual receiving a subpoena should read it carefully to determine who is being asked to appear and testify, or what documents and evidence are being requested. Subpoenas requesting documents or tangible items generally list and describe the items very specifically. The recipient should review the description carefully to determine whether the items are within their possession or control. The document provides the date, time, and location for the individual to appear, or to deliver the evidence. After being served with a subpoena, the recipient has three possible ways to respond, including (1) complying with the subpoena as requested, which is often the easiest, (2) convincing the court that complying is not necessary due to extenuating circumstances, and (3) refusing to comply with the order and face being held in contempt of court. A subpoena is an order of the court; therefore, a person failing to comply to the requests provided in the document is subject to legal consequences, including civil or criminal contempt of court charges. Some of the common penalties for failing to comply include large fines, jail time, or both. Because of the potential legal implications, subpoenas and other court documents should be taken very seriously. Generally, there are only two ways to legally get out of complying with a subpoena: (1) get the attorney who issued it to withdraw it, or (2) file a motion to quash subpoena with the court. When filing a motion to quash subpoena, the individual must provide information and evidence that there has been some error, or there is some valid reason why the individual should not be required to comply. If the court agrees, an order stating that the demands of the subpoena need not be followed. A motion to quash subpoena is filed at the beginning of the court proceeding, and it can be filed by either party. If the judge grants a motion to quash a subpoena, the person does not have to provide documents or testify, if they have already done one or the other, it can be thrown out of the case. A grand jury is a panel of ordinary citizens that reviews evidence, hears sworn testimony, and conducts an investigation to determine whether there is enough evidence to charge an individual with a crime. The grand jury subpoena is issued for the purpose of obtaining evidence, and requiring people to appear and testify before the grand jury. The grand jury issues both subpoenas ad testificandum, and subpoenas duces tecum to obtain the evidence and testimony necessary to determine whether to issue an indictment. A grand jury subpoena carries the same force and effect as a subpoena issued by any other court officer. Contempt – A deliberate act of disobedience, or disregard for public authority, such as a court. Deposition – The out-of-court sworn oral testimony by a witness, which is transcribed into writing for use in a legal proceeding. The witness is questioned by the attorneys for both parties, and no judge is present. Indictment – A formal charge or accusation of a serious crime. I would like to legally and respectfully decline being questioned on the stand about clients participation in outpatient substance abuse program due to the potential to harm the client in any way in regards to reunification. I have prepared a letter of participation and positive progress about the facts for the client to present. Is there CATC II privilege to not speak? If so what is the specific terminology I can use in court? When someone files a subpoena for a production of documents, and the documents are received by the requesting party, but before the documents are delivered to a 3rd party, additional documents are inserted in with the documents received by subpoena, giving the appearance that all documents arrived by subpoena together. What is the penalty for falsifying a subpoenaed document.